Our “K260″ supercharger installation gives the Rover K-Series powered Elise, Exige and 340R a linear torque curve that is a revelation. Incorporating a modified K-Series engine, this kit achieves a smooth-driving 190-260bhp+ power delivery that is perfect for road or track use and can be setup for racing if required. The kit uses Emerald K6 engine management, and is fully installed and testing by experienced Hangar 111 technicians. 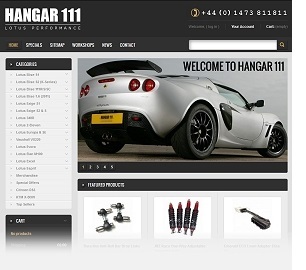 Hangar 111 Supercharger Kit for the Rover K-Series to 260bhp and beyond! Specially developed for the Rover K-Series engined Elise and Exige our Rotrex-based Supercharger kits are available in several forms to cater for both standard cars and those who have already carried out tuning work to their engines. Using a Rotrex C30 centrifugal-type supercharger – specially adapted for Hangar 111 – the system runs between the throttle body and inlet plenum to achieve the best possible part-throttle driveability. The Rotrex charger unit utilises a totally independent oil system that runs specifically designed oil that greatly reduces friction, lowers charger temperatures – in turn increasing durability. Exceptionally low inlet temperatures are possible thanks to our water-cooled chargecooler system which features the same in-house developed technology from our popular Exige S (Toyota engine) chargecooler kits. We offer a complete turn-key supercharged solution (“K260 – The Works”) that completely overhauls the engine internals and cylinder head before the installation of our specially developed supercharger and chargecooler system. The result is a highly durable powertrain that achieves over 260bhp and 190lb/ft without pushing the car to the high rpm limits that ultimately reduce K-Series engine life. Like the majority of our performance packages, “K260″ can be used on the road or track. Please contact us for pricing on this comprehensive fully-installed and set-up solution. We also offer a component kit with the supercharger and chargecooler. This allows you to build up your own specification. Depending on the engine, cylinder head and exhaust system specification, this kit can achieve between 190bhp and 260bhp+. Inlet manifold, plenum, and alloy inlet link pipes. Alternator bracket, pulleys, and belt tensioners. Uprated fuel pump and fuel injectors. Custom-made Rotrex centrifugal-type supercharger with oil system. Silicone boost hoses, all required gaskets, seals and fasteners. Coolant pump, hoses, and electrics. All required silicone hoses, connectors and clips for installation. A low-compression (LC) engine and Emerald K6 ECU will be required. Large-bore exhaust manifold and sports catalyst recommended. Standard cylinder head ported and polished will achieve max 190bhp. Due to the wide variations of aftermarket components fitted to the Rover K-Series Elise and Exige, to establish an accurate quotation for your vehicle please contact us and we can take you through the cost based on your existing equipment. Please note that component specifications are subject to change without prior notice. Images shown may feature additional customer options that can be fitted at time of installation. For current pricing and availability of these kits, please visit our online store. For Rover K-series Turbo Technics supercharger maintenance and repair, please see here.